When Sherry Chen of the BW Greenway said the above words at a recent local foods summit those words struck me. Feeding my family from our CSA farm share [yeah, I was part of the choir at that local foods summit. I don't have the raw data, but I know we're eating more than the 10% locally sourced food we were to pledge to eat. 100% of the beets, turnips, fresh figs and radishes for sure] means, for the most part, I am the one taking the time to make the food. And when that food is not necessarily enjoyed by the entire household it can be hard to justify taking the time for just me. But--I'm worth it. And you are, too. Who is fixing your dinner? Someone has to grow, harvest, and prepare each meal. Even if it's not you. 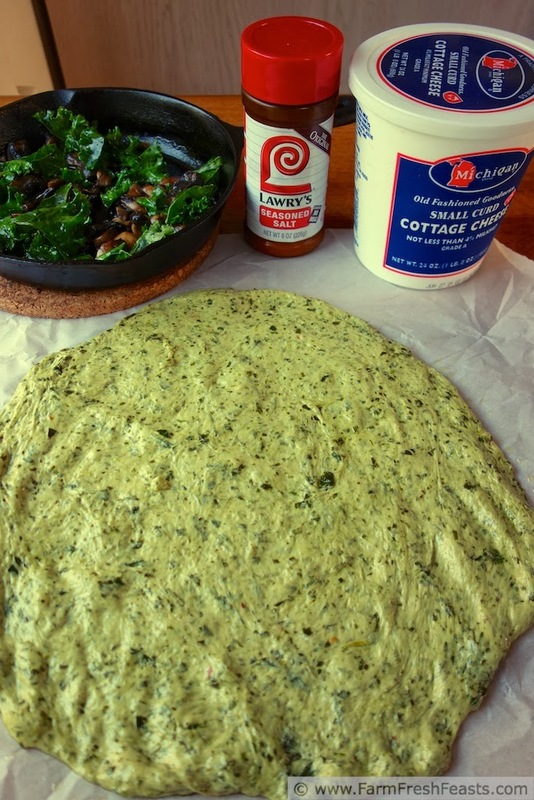 Please refer to my Basic Kale Pizza Dough post for detailed instructions on making dough with kale. 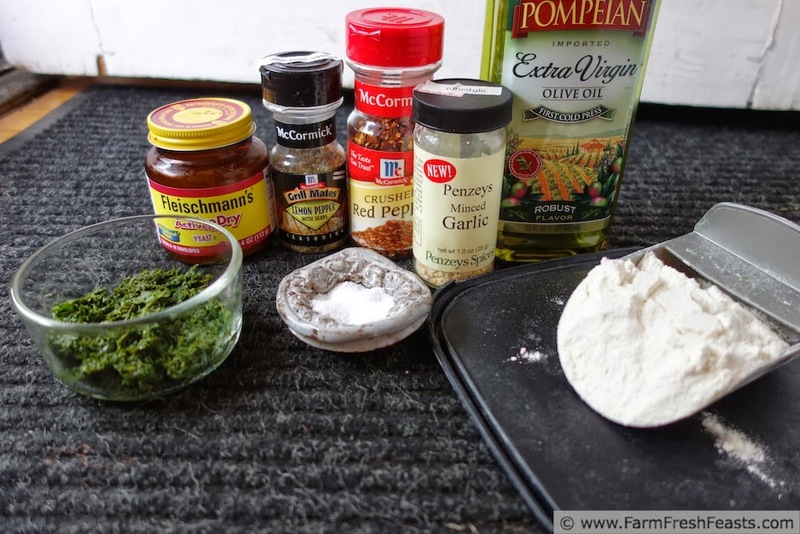 Place all ingredients into a bread machine and mix on the Pizza Dough or Dough setting. Alternatively, add yeast to water and kale in a mixing bowl, stir in flour, oil, and seasonings, and mix until a sticky dough forms. 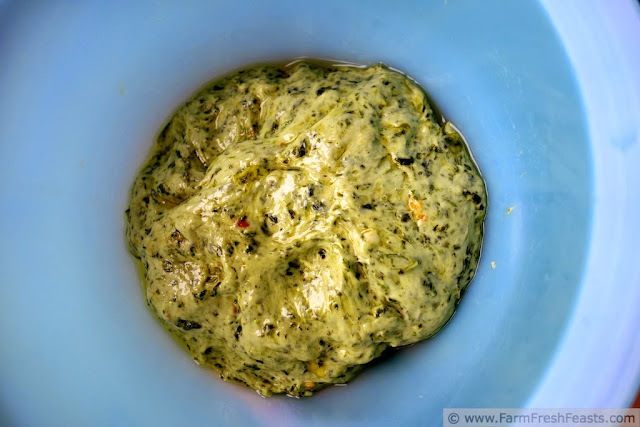 Please refer to my Pizza Primer post for detailed directions on making pizza dough at home. I feel like I'm sending you all over the place, and I don't mean to, I just don't want to make this post any longer than I need. The idea for this combination of kale and cottage cheese came from a comment (thank you for comments!) by Tammy. It sounded delicious and I ran with it. Preheat oven to 425 degrees Fahrenheit. 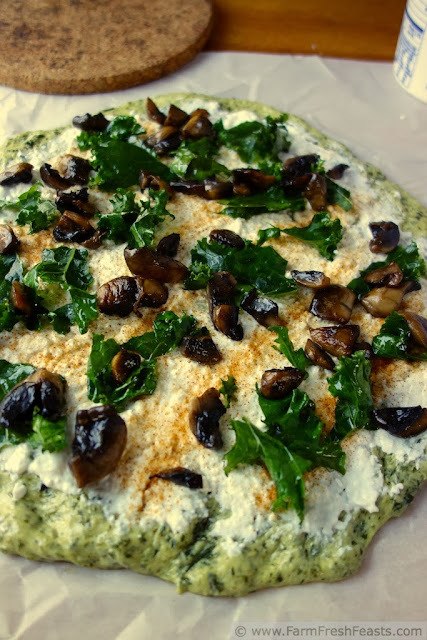 If you have a pizza stone, encourage it to live in your oven full-time. If you don't, go ahead and use a cookie sheet. On an oiled piece of parchment paper (NOW is the time to stock up on parchment paper coupons, with all the baking supply coupons) stretch out the dough into a 9-10 inch circle. Brush dough with olive oil. Set aside to rest. In a small skillet over medium heat, sauté mushrooms until softened, about 5 minutes, and add kale leaves for another couple minutes until slightly wilted. Set aside, and back to the pizza dough. 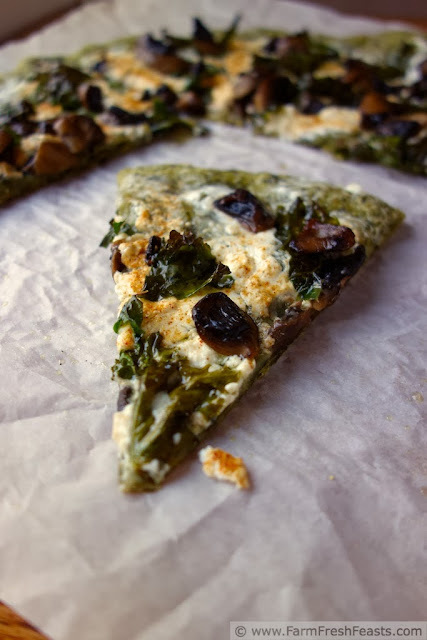 Spread cottage cheese over top of the dough, top with mushrooms and kale, and shake a bit of seasoned salt over the whole thing. Bake on the parchment for 5 to 8 minutes, then shimmy the dough off and bake, naked on the pizza stone or cookie sheet, another 3 to 5 minutes until the top looks dry. Slice (Amazon link to my favorite pizza slicer) and serve. I would come and share this with you any time! I'd be delighted to host you--I hope you don't mind a passel of dogs underfoot. The oiled picture of the pizza dough resting in the bowl is spot on. Seriously, I was mesmerized. Food does take work, but we are so worth it. You would be mesmerized by kale. Thanks for the photo comment--I look at that photo and wonder why I used a blue bowl which doesn't do much for food in the first place (though it's a wonderful storage device). Making good food does take time and effort, but why else do we cook? Sure, to feed ourselves. But I would rather cook with love and quality ingredients than serve something engineered and assembled/cooked/manufactured before it got to the grocery store. Not trying to preach (and it would be to the choir, I know), but just thinking as I type. Three cheers for home cooked, local food! Since I am the choir, I'll give you a big AMEN! And a Hip Hip Hooray! Hip Hip Hooray! Hip Hip Hooray! Yum, focaccia. Yes, that would be tasty--I did an arugula focaccia that was pretty good. I'm interested in topped focaccias right now, because I love the way the crust turns out in my cast iron skillet. This is definitely my kind of pizza! Thanks for linking up with What's Cookin' Wednesday! 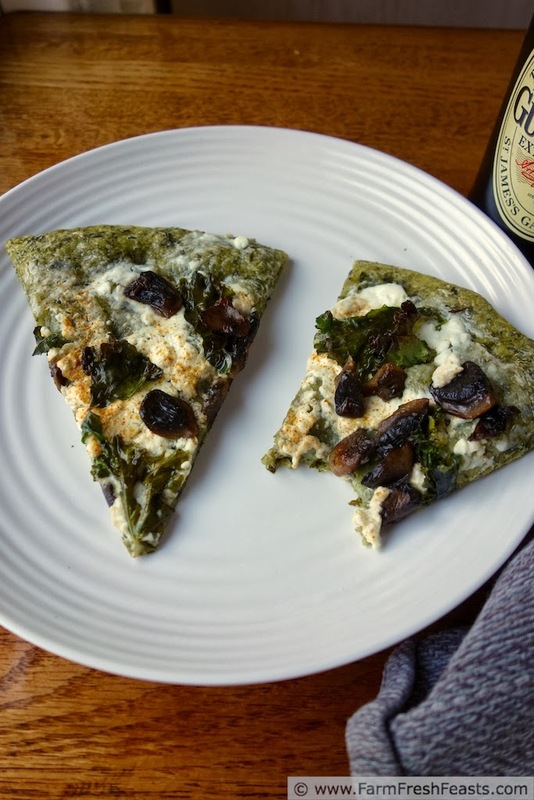 I like any conveyance that gets nutritious kale into my belly and empties the fridge before the next farm share pick up, so this is my kind of pizza too.